Spain is a country where culture, gastronomy and even language varies from North to South, East to West. The large cities are a contrast to the smaller coastal towns. This city, located on the Mediterranean coast, is known for its architecture. Gaudi’s style is present in many of the city’s buildings, including the city’s symbol, the unfinished Sagrada Familia cathedral. The Gothic Quarter is notable for its Gothic architecture, and its streets are filled with chic cafés and vintage shops. La Rambla is one of the city’s main streets, stretching from Plaça Catalunya until the statue of Christopher Columbus by the sea. The street is filled with street performers and flower stands, and nearby is the La Boquería Market, where visitors can join the locals and buy fresh fruit, local vegetables and desserts before enjoying a pan tumaca, white bread drizzled in olive oil and covered with tomato paste. 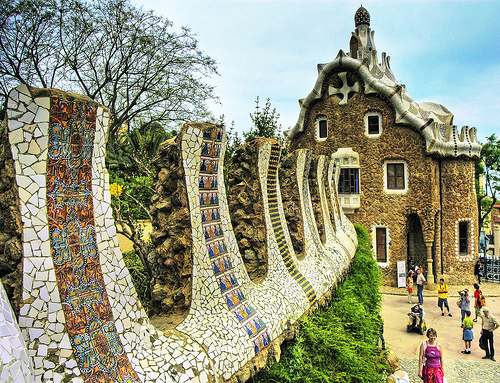 Park Güell is a large park designed by Gaudi located in this city. Visitors will be able to climb up to the observation platform which has views towards the sea and enjoy a walk around this colourful park. The capital city, located in the center of the country, is known for its museums. The Golden Triangle is formed by three major museums, the Prado, the Reina Sofia and the Thyssen Bornemisza. 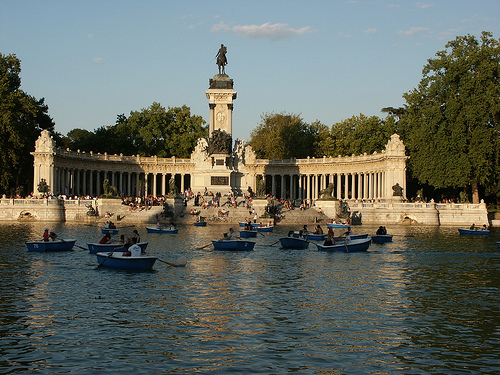 For a relaxing afternoon, visitors can take a stroll in the Retiro Park, a large park located in the center of the city. There is a pond where visitors can rent boats and several art galleries. Madrid’s main shopping areas are the centric Gran Vía avenue, the chic Serrano area and the retro vintage Malasaña neighbourhood. The nightlife scene revolves around the centric streets of the Barrio de las Letras, where Huertas street is located. There are many bars, clubs and discos where visitors can enjoy a caña with a tapa, small traditional appetizers. Located in the Atlantic Ocean just off the coast of Africa, this volcanic archipelago is known for its beaches and its natural parks. Gran Canaria is a circular island known for its beaches, its dunes and its nightlife. On this island travellers can relax by the ocean. There are many bars and restaurants where visitors can savour traditional Canarian fare, mainly papas arrugadas, potatoes boiled in sea water served with red and green pepper sauce. In Tenerife visitors can climb up part of the Teide, the country’s tallest peak. The Teide National Park is filled with trek routes, and there are several black sand beaches on the island. Lanzarote is known for its water sports, and many visit the island to practice windsurf. The island, known for the Timanfaya National Park where visitors can ride a camel and enjoy meat grilled above a volcano, has many small traditional towns. Located in the north of the country, the Guggenheim Museum and the Old Town, where ancient churches and cathedrals are located, are the city’s main attractions. The nearby town of Getxo is a destination for a day trip by the sea. 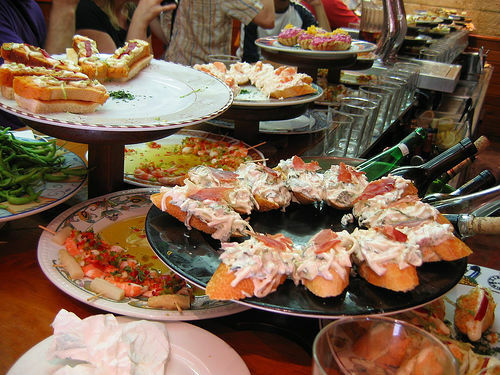 Visitors should not shy away from the local cuisine, known for the traditional pintxos. Pintxos are usually pieces of bread with with an extra ingredient on top held together by a toothpick. Typical pintxos are those made from anchovies, olives and peppers and those made from egg and shrimp. This city is located in the south of the country. This coastal region is known for its beaches, its nightlife and its small historical towns. Benalmádena, Fuengirola and Torremolinos are seaside resorts catering for tourists who seek the beach, with many hotels, bars and restaurants. Mijas and Nerja are traditional white villages, located in the hills and known for their white houses, cobbled streets and views towards the sea. Local bars serve traditional gazpacho, a cold soup made from cucumbers, peppers and tomatoes. After watching first picture i am not willing to see more… one of the best picture at your blog. I visited Madrid for the first time last March. It was a bit cold that time but I enjoyed tasting their local wines and some tapas. At first I did not know that Pintxos is a kind of tapas. I only thought the generally, when I ate that snack, i was thinking of tapas in general. Until I saw this blog with the image of the Pintxos, I just realize that what I ate was not just tapas.